A vital component of our work at SFC is to engage youth in experiential learning with gardening and food systems. We host over 600 youth per year on field trips at our J.P.’s Peace, Love and Happiness Foundation Teaching Garden. Youth who visit the garden participate in hands-on activities aligned with Texas Essential Knowledge and Skills (TEKS) education standards. In 2015, we added a Teaching Apiary to our Teaching Garden in order to provide education about pollinators and the importance of pollinator-friendly gardening and farming techniques. Since then, we have wanted to find ways to get more kids into the apiary, to actually open up the hives and see what the bees are doing inside. We want kids to gain a deeper understanding of the ecology of this superorganism and have a more profound pollinator education experience. Luckily, Me and the Bees Lemonade, a social-profit business started by Austin’s own Mikaila Ulmer, offered to help. Me and the Bees Lemonade supports pollinator awareness in addition to making delicious lemonade. They recently started The Healthy Hive Foundation, which aims to provide opportunities for youth to engage with honeybees in apiaries just like ours. So, with help from a The Healthy Hive Foundation grant, we are excited to offer a new field trip opportunity for students to meet a beekeeper and enter the apiary in protective suits and equipment. 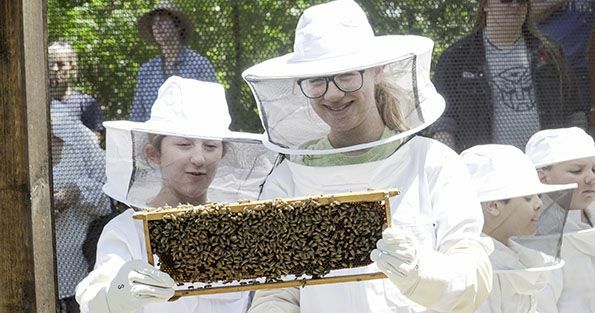 Youth beekeeping field trips will be co-led by Liz Cardinal, our Grow Local Teaching Garden Manager, and a professional beekeeper from Two Hives Honey. 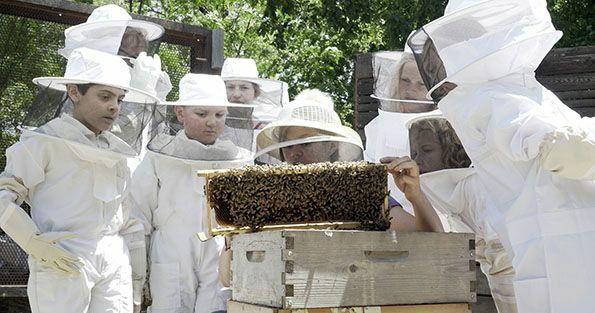 These “Meet the Beekeeper” field trips will serve as an opportunity for youth to learn from a professional beekeeper about beekeeping and the critical role bees play in agricultural systems. Students will participate in a lesson about honeybees and their role in pollination. The field trip will also include an interactive portion in which students will don beekeeping suits, help the beekeeper safely light a smoker, and enter the Teaching Apiary with the beekeeper. In the apiary, students will handle and inspect frames, learn to recognize brood and honey comb, learn about the different castes of bees, and learn the lifecycle stages in the colony. Finally, the beekeeper will remove some honeycomb from the frames, and everyone will taste fresh honey. We plan to deliver four, 2-hour “Meet the Beekeeper” field trips during the 2018-2019 school year, reaching 80 children. If you know students in the 2nd – 12th grades that may be interested in this sweet opportunity, please contact Liz Cardinal for more information. We also have an upcoming opportunity for adults that want to learn about beekeeping and get into beehives with a beekeeper. This Sunday, from 1-4pm, Tara Chapman of Two Hives Honey is leading a Hive Tour at the Teaching Apiary. Tickets are available here.